Stir fry with nuts and seeds. This bowl is bursting with flavour and zing. 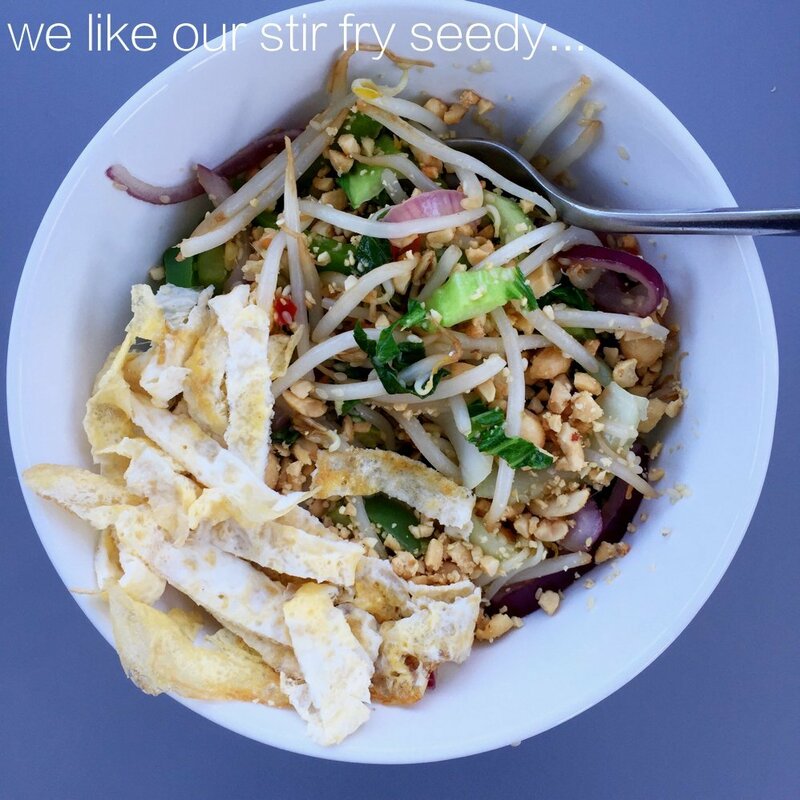 Swizzle your fork and scoop up a delicious combo of beansprouts, peanuts, sesame seeds and egg ribbons. Fast, easy and delicious midweek meal. Quick, tasty, healthy supper for two. Add a small splash of sesame oil to a wok style frying pan over a medium heat and pour in the beaten eggs - swirl the pan around so that the eggs set as an omelette. After a few minutes flip and quickly cook the other side then set aside on a plate. Add the rest of the sesame oil - tip in the sesame seeds and let them sizzle for a minute then add the garlic, ginger, onion and beansprouts and fry over a high heat until starting to soften. Add the pak choi and tbs of chilli sauce. Stir fry for a couple of minutes. Whilst stir fry is cooking - cut the omelette into ribbons. Divide between two dishes and top with the crushed peanuts, omelette ribbons and a dash of soy sauce to serve. Make it more substantial but still quick by adding a scoop of microwave rice. Add fridge leftovers such as broccoli or shredded carrot. Switch pak choi for spinach or shredded greens. A really easy weeknight winner.